One-piece, clear sign holder forms its own stand for simple vertical or horizontal display. Easy-to-load design lets you quickly slide in items between the plastic for immediate use. L-shaped base is designed for use on all flat surfaces. 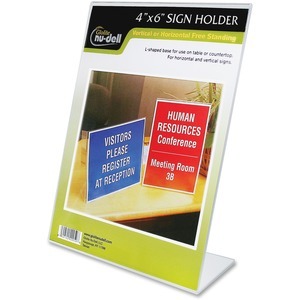 Sign holder is perfect for displaying pictures, award certificates and more.